Reproduction of Antonio Stradivari Violins, made in China. Available in 3 sizes! Suitable for intermediate to advanced players. 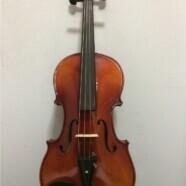 You are getting value for money with this violin here. Handpicked flame spruce pieces and handcrafted with care.